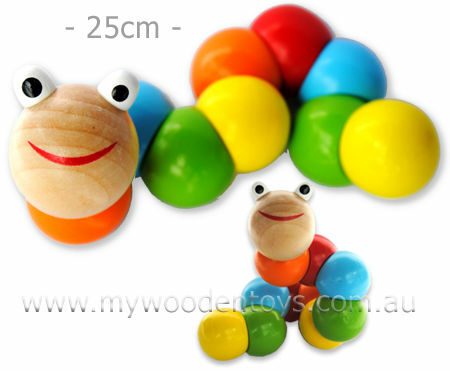 Big Wiggly Wooden Worm is a fun wooden toy which is great to twist turn and wiggle. Each part of the toy is movable and held together with elastic so you can bend, turn it and put it in all sorts of positions. This is a fun toy and helps with fine motor skills as well as being a great distraction. This toy is suitable for 18 Months plus and is beautifully smooth and great for little fingers and hands. Size: 25cm long fully stretched out. Material: Wood, Child safe paint Elastic. We like this because: "A fantastic size... A wonderful fiddle toy"